The parts described in this information were researched, developed, and manufactured based on Japanese Model cars and are pursuant to Road Trucking Vehicle Law of Japan. They are not proven to be applicable outside of Japan. 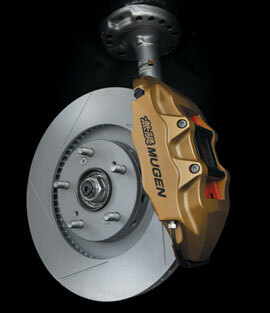 We would like to advise you of the release to the market of new MUGEN products for Civic Type R – effective 2011. ■ Advanced Complete Brake System This brake system consists of monobloc front caliper, front / rear pads, large-diameter reverse bench configuration front rotor, micromesh brake line which are all exclusively developed for CIVIC TYPE R (FN2). Stopping performance and controllability of the brake system are excellent and consistent under all driving conditions. ■ Front Wheel & Fender Cover set This set is composed of MUGEN Forged Wheel “GP” (18 x 8J Offset 46, 2pcs) and Front Fender Cover (FRP, Unpainted, Front & Rear). 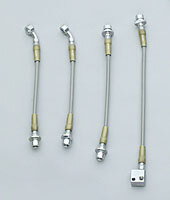 Optional parts for Advanced Complete Brake System. 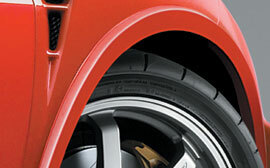 ■ Recommended tire size: 225 / 40R18 * Please be sure to install this wheel together with fender cover.